Caregiving is one of the courses offered by Technical Education and Skills Development Authority (TESDA), a program that lets aspiring people to obtain knowledge in providing quality care for infants; children; senior citizens and even people with disabilities. Supporting them in their basic needs; with their personal and hygiene related needs such as; taking a bath; changing clothes; medical maintenance and other related supporting actions that they need. Undergoing this training will lead you to knowing the proper physical approach, proper social approach, proper intellectual approach, and proper emotional approach. This course is not as easy as it sounds for it requires total patience, dedication and willingness. Otherwise, one will not be suited in becoming a caregiver. On the other hand, countries are in need for such applicants so it will be easier to be hired that any other job opportunities there being offered. 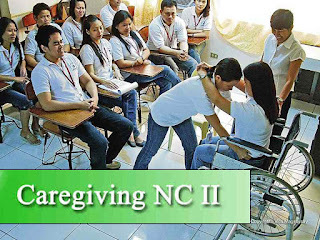 Course duration (Training time that will be consumed): Caregiving NC II will take up to 234 hours to complete. You may be able to work abroad as Domestic Helper or even local caregiver, aiding for the needs of your patients. This is in demand to any country such as Qatar, Saudi Arabia, Kuwait, Hong Kong, Japan, and Australia. This is one of the highest paying works in other country that does not require any college degree so more applicants are expected to submit their application forms. Even experienced Domestic Helpers are applying to this course to boost their chances in being hired. National Certificates are required for some job opportunities international. Bakit wala sa davao city? Bakit po wala sa part ng MIMAROPA region? So sa probinsya lang to oferred ? kc lahat mg schools sa list nsa provinces po..
i just wanna ask po if makakaenroll ka ba ng caregiving nc2 kung dmo natapos caregiving nc1? Meron po ba kyo dito sa cabuyao, calamba or sta.rosa laguna? Di po ba pwd undergrad ng highschool.. peo with experience na po caregiver.. I just need a proper traning..
Wla po d2 s free d2 s Manila? wala po ba s dasmarinas cavite?need p po b magtake ng nc1 bago magtake ng ncII?